Kite and kontiki longline fishing rigs are extremely productive on the west coast when conditions are right, but sharks can cause expensive losses. The only way to minimize any chance of major gear loss is to use a Kite Dropper Rig on the west coast. With such good fishing on the west coast of New Zealand kite and kontiki fishers are almost always guaranteed a feed of something, no matter what the time of year. Large snapper, gurnard, kahawai, spotted dogfish, kingfish and trevally are among the wide range of fish available to those able to deploy their gear 600 meters or more offshore. While many fishers are very successful when using any of the above Bottom Longline Rigs on the west coast, this area has always had a reputation of challenging conditions. High surf and strong long shore currents alone are enough to prevent many methods from working in all but optimum calm sea conditions accompanied by strong offshore winds. This year huge numbers of sharks have been added to this scenario and created a lethal mix which has increased the risk of gear loss for all means of deployment except kite deployed Dropper Rigs. 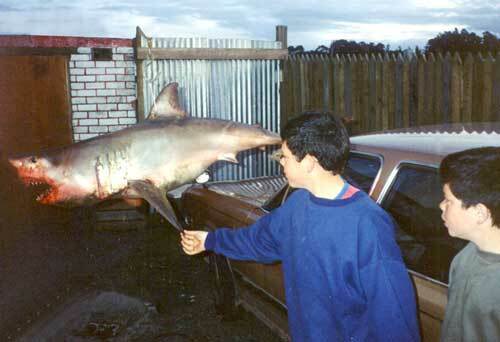 The recent unprecedented plague of sharks has caused havoc on the west coast for kite and kontiki fishers alike. Sharks are the second most common cause for gear loss on this coast, (the main reason out of curiosity is loaning your gear to someone unfamiliar with this method of fishing). 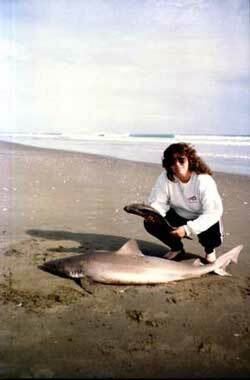 Peggy Barnes with an average sized school shark taken on an 8kg Pocket Sled Rig from Muriwai Beach. Peggy hauled the shark in from around 500 meters offshore on a penn 320 GTI level wind reel. One of the main facts on sharks for kite and kontiki fishermen to consider is that although seven gill, bronze whaler, hammer head, mako and white pointer sharks all compete for food on the west coast, these species cause few problems. It is the humble school shark (tope) which is the main culprit and although these sand sharks average only 10 to 25 kgs each it is their sheer numbers that cause the problems. 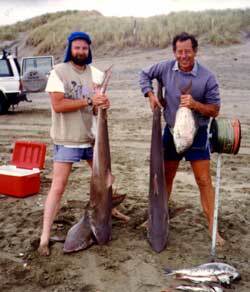 Alan Radcliffe and John Whitcombe with a catch of big school sharks taken from Muriwai Beach. Thanks for the info on sharks and pictures of sharks Alan. As longlines are set out species such as kahawai and gurnard are hooked up very early in the set. Gurnard in particular are notorious for swallowing baits and it is this which starts the sharks into the feeding frenzy. The gut hooked fish panic and begin to die sending out distress signals which is like ringing a dinner bell for sharks from up and down the beach. Under the best circumstances the fisher will retrieve all his gear (minus a few hooks and traces) and several fish heads generously left by the ravenous sharks or they will struggle for an hour or two to retrieve a line full of sharks as well. Unfortunately for a few the mainline breaks or is bitten off by the sharks. If the fisher is using any of the Dropper Rigs then only part of the hook section is lost, (a $15.00 item). The kites and mainline are recovered intact. Those using kite, kontiki raft, submarine, bag and balloon Bottom Longline fishing rigs can lose everything. Sharks have a nasty habit of grabbing the fish and rather than just taking it and swimming away they begin to roll with the fish (and sometimes your mainline as well) firmly wedged in its jaws which inevitably winds up causing the gear to break. For those west coast kite and kontiki longline fishers who wish to fish during these adverse times there are some things you can do to greatly reduce the chances of being bitten off. Because it is the dying fish which attracts the sharks to your line in the first place the most successful course of action is to prevent the fish from becoming gut hooked to begin with. Your selection of hook type is an important factor to consider. Jap longline hooks are specifically designed to be fished on unattended lines where the fisher is not required to keep constant strain on the line in order to keep the fish hooked and improved versions of these hooks also minimize gut hooking. As Target fish hooks have the lowest gut hooking rate of any fish hook available we highly recommend these hooks as a first line of defense against attracting sharks to your gear. However, the sharks may already be right where you are setting. Keep your first set short. That is, set your gear to the distance you normally would but only leave it stationary for 10 to 15 minutes before retrieving it. If the gear has been set correctly, at a slow walking pace, you will have caught fish both as the gear was setting and during retrieval. If the line returns with only a few fish and no signs of shark problems such as heads only or missing traces, then it is safe to leave the gear set a little longer the next time, up to 20 minutes should be plenty long enough because the sharks are not in the immediate vicinity. The bait you use is another thing to consider. Sharks don't usually hone in on baits, it simply isn't an economical meal for them. However, large bloody baits, baby squid and octopus are to sharks like an ice cold beer on a hot summers day, a real treat. Fresh mullet or just caught kahawai, scaled and cut into strips of about 5 cm long by 2 cm wide is ideal for catching fish such as snapper and gurnard while not attracting too many sharks. 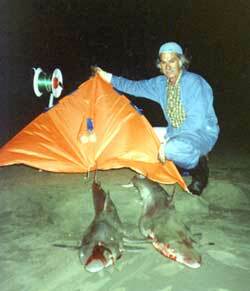 Hal Ellison with a couple of large kite caught school sharks taken from Northland. Thanks for the sand shark pictures Hal. If you have been unfortunate enough to attract sharks to your line it is generally a good idea not to reset your gear in the same place. They tend to hang around like seagulls just waiting for their next meal. The best thing to do is pack up all your gear and move a couple of kilometers up or down the beach and try again in the hope that the sharks will stay where you left them. White shark picture above : As far as we are aware, Colin Sherman of Dargaville, is still the only person to have landed a white pointer shark on a kite rig in New Zealand. The Sherman boys look on in awe at Dads catch. The shark was taken on a normal 22 kg breaking strain snapper trace run from a Paul's Fishing Kite Bottom Longline Rig. The shark had 3 gurnard in its stomach which it had just taken from the line and the hook that caught this monster was a little 16R Tainawa Jap longline hook which had hooked up right in the corner of the sharks mouth. Be wary of altering your kite or kontiki gear in an attempt to out smart the sharks. All of Paul's kitefishing rigs are designed with specific weak points which ensure the minimum gear is lost in any eventuality. With our 22 kg traces attached to a 100 kg mainline sharks will generally just break off the trace with little or no damage to the all important mainline and kites. The temptation of using steel traces or knotted mainlines should be avoided at all cost. Your line is only as strong as its weakest point. A good example of this is several years ago a kitefisherman from the Port Waikato area had convinced himself he was losing traces to giant snapper. Determined to land these huge beasts he replaced all his existing traces with 200 kg steel traces crimped to 14/0 and 16/0 tuna circle hooks baited with a whole fillet of mullet on each one. After losing eight kites in short succession we asked to see the kite fisher's gear to find out why he was losing so much gear. It didn't take much to fix the problem, he was obviously catching such a great weight of sharks that were unable to break free and he was unable to haul in by hand. He reported his line generally broke after wrapping it around the tow bar of his vehicle and attempting to haul it in this way. On a lighter note, the sharks have reportedly headed offshore and kitefishers from Muriwai and Baylys Beach are now reporting the excellent catches of snapper and gurnard more consistent with this time of year.